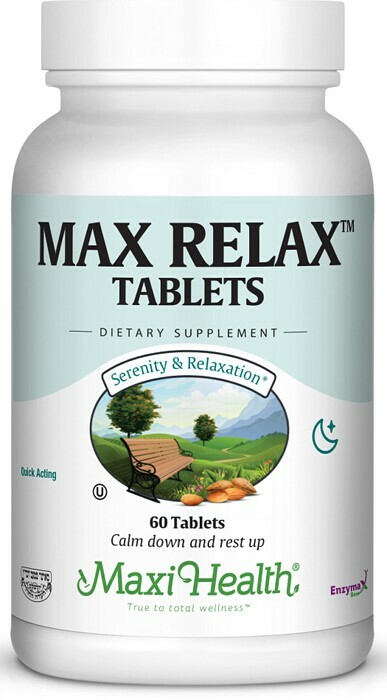 Max Relax™ in convenient tablets or capsules are our own proprietary blend of essential amino acids, B vitamins in combination with valerian root and minerals, such as calcium, magnesium and much more. Check out the supplement facts and see for yourself. Get non addictive Max Relax™. Take two (2) tablets or capsules daily before meals, or as directed. Other Ingredients: Vegetable cellulose, Microcrystaline cellulose, magneskum stearate, and Enzymax­® (calcium carbonate, bromelain, papain, lipase, amylase, protease, silica). This product contains NO soy, gluten, wheat, salt, sugar, milk, yeast, artificial preservatives, flavors, or colorings. Enzymax®, a vital digestive enzyme complex, is a registered trademark of Maxi Health Research®, Inc.
My husband uses your Max Relax and we see wonderful results. He is a lot calmer and relaxed. Thanks for your wonderful work.